Deciding to host an event can be intimidating. Fortunately many in our AHC Community have already taken on many of the most common event ideas with great success. The Foundation welcomes you to use the resources provided here to unify the identity and the purpose of all of our fund raising efforts. We have gathered feedback from many events and are always getting more from ongoing efforts. We will certainly share all we can to give a boost to the success of your event. Check back for updates periodically. Please utilize these resources in Planning your event. Foundation Guidelines for Fundraising: If you need funds from the foundation to execute your plan, we have a few rules. T-Shirt Designs: EAST FORK STUDIO doanted a few WhizBang designs for our cause. Check them out! (PDF) Contact us for files ready to take to your T-shirt folks, or ask us where we get ours! 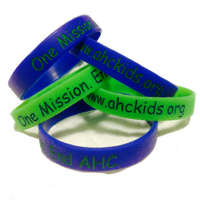 Wristbands: Contact AHCF to request some fashionable rubber wristbands emblazoned with our mission, and our website. Sell them, Pass them, Raise awareness! Logo Files: Download the AHCF logos in various formats for use in your event propaganda! Sample Brochures, Flyers and Posters (Word and PDF Format) (coming soon): See some examples of successful print products used by events passsed. We can help develop your products. Just ask! Runs and Walks Toolkit: A package of experience for you to use. Check one out, then bring it back better than you left it! Share your lessons to improve it. Event Specific Toolkits: More packages of expertise are coming your way. Check back with us! AHCF has brochures, posters and flyers to help with your fundraising efforts already developed. We can help by creating a flyer, or signage for you to bring to your local printer for production. We may also be able to support your efforts with wristbands or T-Shirt designs. Please contact AHCF for more information. Looking for a fun way to sign up sponsors for your local AHCF jog-a-thon, bowl-a-thon or our next national fundraiser? AHCF Sponsor Sheets help you spread the word and make it easy for people to sign up to help. They’re ideal for company break rooms, community centers, waiting rooms and anywhere else where people congregate. We are working to have an ecommerce site! Look for t-shirt designs, stickers, wristbands, and many other items that will help raise awareness for the AHC community.